You do know the expression 'better late than never ...', don't you? I hope so, because this is the Autumn issue of our newsletter, and I can hear Xmas music on my radio as I sit here working on the layout ... But we have a pretty good excuse for the tardiness this time; there is a ton of work getting done here these days, with a stream of new and interesting prints getting made, and that has to take priority! As you will see, most of the news items this time are related to the Ukiyoe Heroes project that I mentioned in the previous newsletter. That work is moving forward very well, and is serving to introduce our woodblock prints to a completely new audience. But it doesn't stop there, because as you will read inside, we have yet another new project to show you this time too. We are having a lot of fun with our new Chibi Heroes print series, and I hope you will find it to be of interest. And in a long-overdue story, I will introduce you to all the new faces who are now working here together with me, in what has suddenly become a very crowded workshop. In the previous issue of this newsletter, I brought you a capsule introduction to the Ukiyoe Heroes project that at the time was just getting under way. How has it progressed since then? Perhaps the easiest way to answer that question is to point out that this 'Autumn' edition of the newsletter is coming to you in early-December ... Yes, we've all been a tad busy recently! I mentioned in that previous story that I was working with Jed Henry (the US-based illustrator who is creating the images) to set the project up on a crowd-funded basis, and we did so through the Kickstarter website. For those of you not familiar with the concept, let me explain how this sort of crowd funding works. There are many creative people who have ideas for projects but no money to put them into production. Kickstarter allows such creators to put a proposal onto a website where potential backers/customers can take a look at it, and if enough of those viewers decide to support the proposal by putting forward a small amount of money, the project can gather enough funding to get under way. Typical proposals on the Kickstarter system include such things as: a band wanting to make a CD of their music, a young manga illustrator wanting to publish a book of comics, a theatre group wanting to hold a performance, or ... a woodblock printmaker with an idea for a new print series. For some projects, the people who choose to support the idea will expect to receive nothing but 'Thank you!' from the project creators, but in most cases they will receive something tangible in return for their sponsorship: the CD, the book, tickets to the performance, or ... the woodblock print. Jed and I thought this might work for us, so we proposed a series of prints to be based on his designs, setting the 'goal' of our campaign at the level of financing that would cover the costs of producing the first one - just over $10,000 (about 800,000 yen). We set the length of the campaign at 30 days, and we felt fairly confident that we would be able to gather that level of support before time ran out. In the period before we actually set the Kickstarter campaign in motion, we made extensive efforts to publicize our plans, building a presence on Facebook, where we showed our proposed designs along with plenty of other materials that would help potential backers understand what we were trying to do. I also made some videos that showed the carving and printing process, and put them up on my YouTube channel, where they began to attract quite a lot of attention. The net result of all this careful planning and preparation was that the Kickstarter campaign was indeed wonderfully successful - it reached the initial goal in just 73 minutes, and by the time the dust had cleared, had surpassed it 30 times over. We are not sure just where the project will lead us, but Jed has already begun the creation of still more designs, many of which attracting a lot of attention from his Facebook followers. It could be that the Ukiyoe Heroes project will be with us for quite a long time ... we'll see! Quite a number of Japanese words have made their way into English over the years, and a fairly recent one is the term 'chibi'. Do I really need to explain its meaning? Well, three words - small, playful, and cute - pretty much encompass the concept, and if you are wondering what connection this might possibly have to woodblock prints, well here you are! 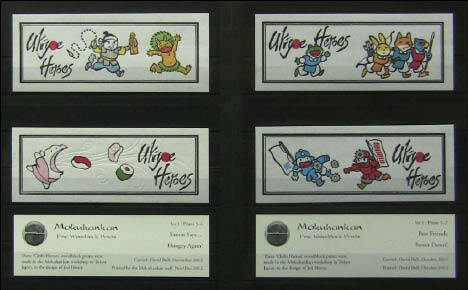 Our new 'Chibi Heroes' series is of course an offshoot of the Ukiyoe Heroes prints I introduced on the previous page. The concept is similar - taking favorite video game heroes and putting them back in an ukiyo-e style - but the whole project is very small scale, and the images are much more playful. Jed has been sending me a number of sketches, and every month I select two of them to be turned into woodblock prints here in our Mokuhankan workshop. I myself am doing the carving, and the blocks are then printed by the ladies on the printing crew here. 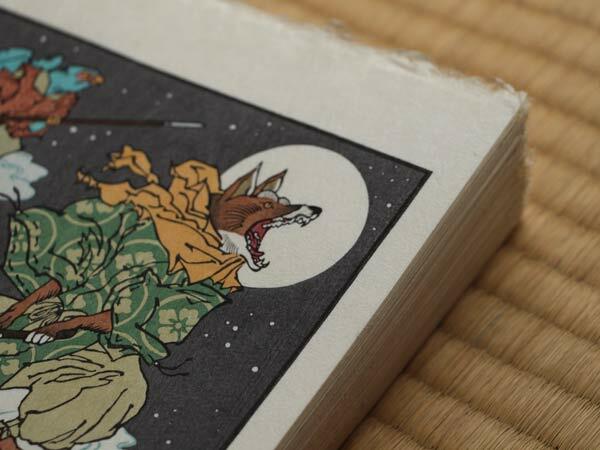 The Chibies are made with the same high quality materials that we use for all our prints here - hard cherrywood blocks, and hosho paper from the workshop of Ichibei Iwano. When my own children were growing up we had no TV in the house, so I myself have no experience with playing the video games that most of these designs are based on, but I am finding this no handicap to enjoying our Chibies. The clean and very colourful designs are quite simply fun to be around! The photo on the next page shows one recommended method for you to store and view your growing Chibi Heroes collection - in a small album designed for postage stamps. These are available anywhere, in stamp shops and online, and will do the job perfectly. In keeping with the 'chibi' nature of the project, we have worked very hard to make these delightful little prints as inexpensive and easily collectible as possible. Each monthly pair is only $20 plus $2.50 shipping (to anywhere in the world). Head over to the Chibi Heroes website to learn more, and we look forward to sending you some of these fun little prints soon! It has been quite a while since I brought you an update on the Mokuhankan staff, but given that it is getting to the point where I myself am having trouble remembering names, I guess you too could do with a refresher. Here's our current lineup! We met Tsushima-san in this newsletter over a year ago; she was the first person to start here as a printer trainee. Given that she is a mother with three young children (including two pre-schoolers), she isn't able to be here more than a couple of times a week, but within that constricted time frame she has made good progress. Literally hundreds of her prints are now in the hands of our collectors and customers, and over the coming years, those will be joined by a lot more, we hope! Fujii-san came to us on the recommendation of a printmaker friend of mine in the US. She too has been free to be here only a limited number of hours each week, due to school/study responsibilities, but beginning this autumn, she will be able to concentrate more on her work here. She splits her time here between printing training, and general duties including work on our Japanese website. Ayumi-san is not quite your typical teenager. After finishing high school in Hokkaido last spring she headed for the big city to make her mark ... in traditional printmaking! Her main interest is in studying how to make the baren - our main printing tool - but learning how to actually use it is important too, so she spends a few days each week here at one of the benches. Ishikawa-san came to us on recommendation of carver Asaka-san, about whom I wrote in this newsletter a few months ago. She is working with him on learning how to carve, and here with me on the printing side of things. I myself would prefer that people concentrate on one skill, but given my own history, I can't really complain about her plan! Now that we are essentially running two separate businesses here - my own subscription print series (all the work carved and printed by myself), and the Mokuhankan productions (printed by the crew above) - we are shipping a lot of prints these days. Getting them packaged and then shipped is the responsibility of Yasui-san, who has now been here something over a year. A typical batch of print orders is quite a mixed bag, heading out to addresses all over the world, but she handles the sometimes confusing stack I give her very conscientiously. Ishigami-san has recently taken on a new job with us, one that just started last month. Yes, she's the person managing the new Chibi Heroes project. She takes the stacks of prints from the drying boards, then checks, trims, and mounts them in their backing sheets. When shipping day rolls around, it's her responsibility to see that the hundreds of little prints get sent off to the waiting collectors. As that series grows, we intend to run her off her feet! Although Numabe-san could probably handle all our 'outside' printing requirements by himself, we think it is a better policy to try and use this Kickstarter opportunity to support other people too, and have asked Tetsui-san to join us in working on this project. He appeared in this newsletter last year when I asked him to print some of the prints in the Senshafuda project I tried to get going at the time. He did a very good job with those, so I am very happy to have him back to help with our Ukiyoe Heroes work. So there we are ... None of these people are working here full time of course, but it seems completely astonishing to me that I am helping to support nine people and their families! No wonder there's nothing left in the kitty at the end of each month! In the story about the Ukiyoe Heroes prints I mentioned that our videos on YouTube were attracting attention, and it's worth letting you know a bit more about what we are doing there. Some months back I purchased a (used) video camera - a type that will record in High Definition video - and since then have been using it to record scenes of the carving and printing work. At first I was just recording random bits and pieces of the printmaking process, but when work started on the second print in the Ukiyoe Heroes series, I decided to try and create a series of videos that would allow people to see the entire process, start to finish. None of the people working here have any particular skills at using a camera like this, so I have to do the recording by myself. I fix the camera to a tripod next to my workbench, and use a remote control to turn it on whenever I get to part of the work that I would like to catch. I use some video editing software on my computer to stitch these pieces together, add a narration where appropriate, and then upload the result to YouTube. 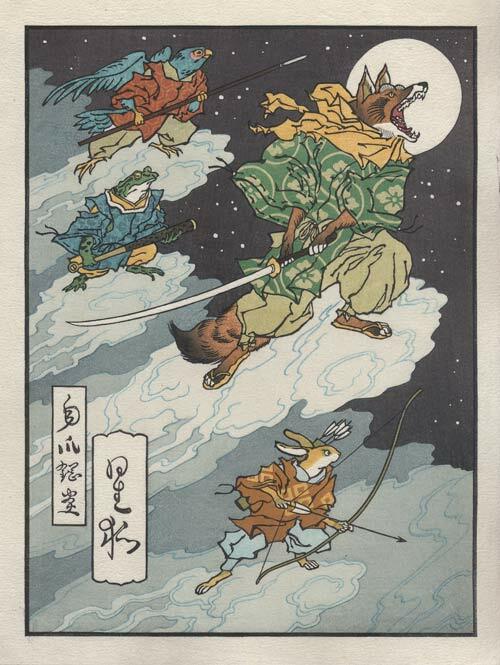 The series of videos I have created has really helped our new collectors - the young people interested in the video game characters - learn about how these woodblock prints are made. My YouTube channel is getting linked here and there by various blogs and websites all over the internet, and the most popular of my videos - one showing the carving process - has been viewed over 70,000 times. Many new readers of this newsletter must be puzzled by the title 'Sadako's Corner'. That name doesn't appear in the story introducing the Mokuhankan staff members. Who is this? Simply put, I am a lady who was attracted by Dave some years ago, and since then have had the pleasure of being with him, and occasionally helping with his business matters. One particular memory from our early time together stays in my mind: a small room in his then apartment, with sunlight streaming through the windows and modern music filling the air. 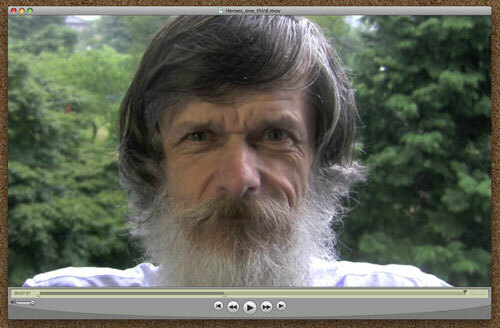 Concentrating on his work, he hadn't heard me until I had approached quite closely. I saw a different aspect to his character, as he hunched over his bench working at his wood carving; the air of peaceful concentration was completely unlike the quick-paced character who could sit at the keyboard typing like a bullet, and race through the organization and execution of whatever jobs were at hand to be done. I was attracted by both the quietness, the way that he could make my head spin with his bright and fast-paced conversation, and by his approach to life. Much time has passed since then, and we have drifted like buoys in the ocean. People who are running a business in this era - when the onset of the internet has turned everything upside down - are forced with great challenges to survive. Dave is no exception to this, and has been making every attempt to successfully ride these new waves. On top of this he has now begun the actualization of a long-held plan to expand his workshop to train other craftsmen. I myself have never had any particular interest in woodblock prints, nor would I really be happy if my private space were reduced to Dave's pattern of living in just the tiny area of a couple of tatami mats. With Dave being totally wrapped up in his work, and myself being situated somewhat outside it, our two buoys have drifted apart somewhat, and this was particularly brought home to me as I translated this issue of the newsletter. Long-time followers of Dave's work will find very little in this newsletter that is familiar, as the business pattern that he has followed for many years reaches a major turning point. But it is important to note that my respect for this smart and very capable guy has not changed at all. We are in almost daily contact - talking by video software every evening - and it is my wish that we can maintain this pleasant relationship as long as possible. And yes, we even sometimes manage to find time to have dinner together! Well, now you know me – Sadako. I will continue to work behind the scenes - as long as I am needed! In any year, November is pretty much the busiest time here in this workshop, as the small Gift Prints we produce are very popular for Xmas items, but having extra staff here to help me with the printing on those has helped a bit this time around, and meant that I myself was able to make a short 'escape'. I flew to Vancouver for a few days with my family, and then went down to LA for a weekend at a large convention together with Jed, where he was displaying his Ukiyoe Heroes designs. 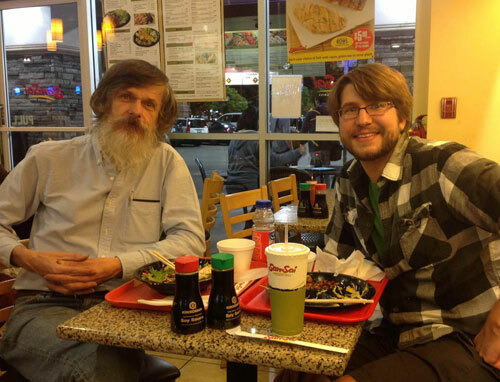 Although we have now been doing business together for nearly half a year, this was our first meeting, and somebody remembered to try and catch a quick snapshot that first evening while we had dinner in a little Japanese fast-food place. Most of the attendees to the show were youngsters in their twenties/thirties, and it was very gratifying to see their positive response to our work. I must say though, that there is one aspect to this new venture that is a bit difficult for me to get used to. Far and away most of our customers - and even Jed himself - are nowhere near even half my age. I'm mostly dealing with people who could literally be my children, and after years of holding exhibitions here in Japan where - for the most part - the viewers have been people my own generation or older, this is quite a switch. Looking on the bright side though, I suppose that this might help me keep a youthful attitude ... at least I hope so!